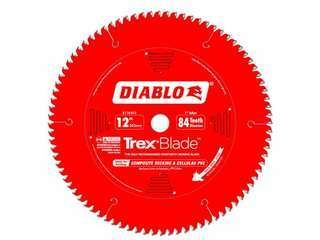 Diablo's TrexBlade is the only recommended composite decking by Trex Company when cutting composite decking materials. These new blades deliver maximum performance and highest quality of finish; making it a "must-have" tool for both professionals and DIYers planning composite decking projects. Diablo's new saw blade series has a modified triple chip tooth grind design, Perma-SHIELD® non-stick coating, and specific TiCo™ Hi-Density carbide to deliver more efficient and cleaner cuts with no swirl marks, less "gumming" of blade teeth and longer cutting life. This blades includes innovative features including four-strobes versus the industry standard of two, a Thin Kerf option for less waste and increased board yield as well as larger depth of tooth design for superior impact resistance and more resharpenings. 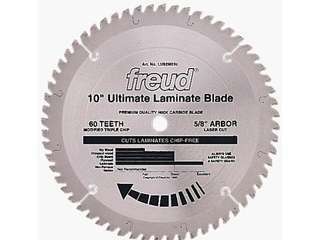 This blade includes innovative features including four-strobes versus the industry standard of two, a Thin Kerf option for less waste and increased board yield as well as larger depth of tooth design for superior impact resistance and more resharpenings. Industry first four-strobes versus current market 2-strobe design for less heat and binding on the blade body. 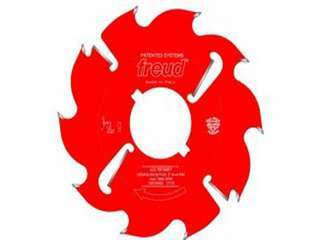 Especially when cutting wet material, four-strobes allows the blade to cut more efficiently, reducing the amount of stress on the blade. 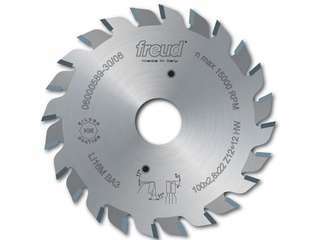 This blade features laser-cut, anti-vibration slots that practically eliminate the vibrations that resonate in standard blades. Ideal For: Stacked Chipboard and Man-made Materials. 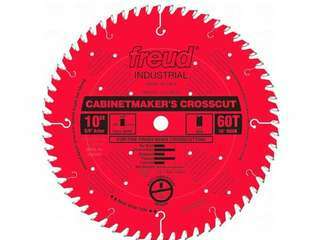 Crosscuts (1/2" to 2-3/4") & Rips (3/4" to 3/8" ). This multi-purpose blade will cut stacks of man-made wood products as well as hardwood and softwood up to 2-3/4" thick. The blade’s deep gullets and TCG rip and crosscut through hardwoods and softwoods with ease. Although the ideal working range is 1/2" to 2-3/4" thick, thinner or thicker materials may be cut, resulting in some loss of surface finish. 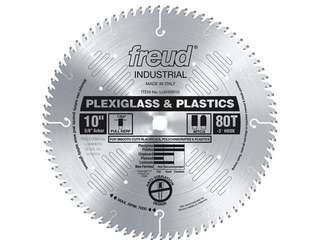 Ideal For: Plexiglass and Plastics. Depth of cut (1/4" to 1-5/8"). 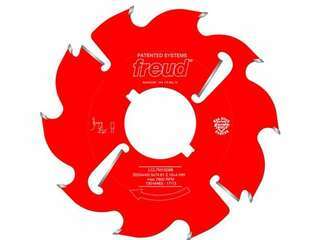 This industrial blade cuts acrylics, polycarbonates and other plastics, leaving a smooth finish without melting. 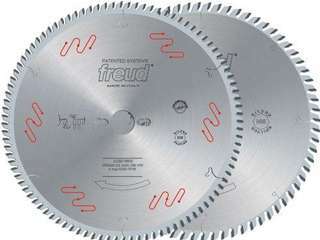 By combining micrograin carbide tips with a specially modified triple chip grind these blades will give a clean smooth cut. 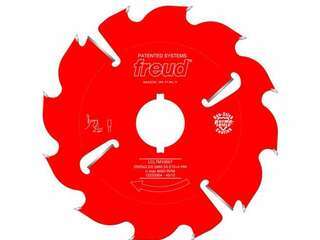 These blades produce less heat keeping the cut edge crisp. Ideal For: Solid surface materials such as DuPont® Corian®, Wilsonart Gibralter® and SSV Fountainhead®. 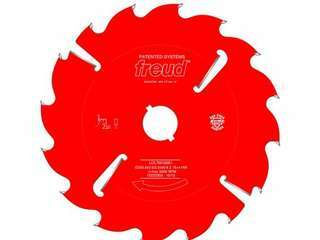 Depth of cut (1/4" to 1-5/8"). With this ultimate solid surface blade, there is no need for stabilizers. This blade features teeth with a specially designed triple chip grind for leaving swirl-free cuts in solid surface materials such as DuPont® Corian®, Wilsonart Gibralter® and SSV Fountainhead®. The laser-cut anti-vibration slots reduce the sideways movement of the cutting edge against the solid surface material, dramatically extending cutting life.